BERLIN -- Volkswagen Group said group operating profit more than doubled in the second quarter, helped by cost cuts and higher-margin new models at its core VW brand. Earnings before interest and tax jumped to 4.55 billion euros ($5.34 billion) from 1.90 billion a year earlier, VW said in a statement on Thursday. "I am firmly convinced that our financial footing is adequate to cope with the transformation in the automotive industry and topics of the future," finance chief Frank Witter said in the statement. In another sign that VW is on the mend, the company did not announce any further provisions related to its cheating of U.S. diesel emissions tests. The group has to date set aside 22.6 billion euros to cover fines, compensation and vehicle refits. VW's recovery, however, has been clouded by news that European and German regulators are investigating allegations of decades-long collusion between VW, BMW and Daimler. VW shares were 1.3 percent lower at 134.85 euros at 0835 GMT, with Daimler and BMW down 0.7 percent and 1.1 percent respectively. "VW results are in line with expectations. But auto shares will remain under pressure over the cartel allegations," said NordLB analyst Frank Schwope. "VW could face a single-digit billion-euro fine if the allegations turn out to be true," he said. 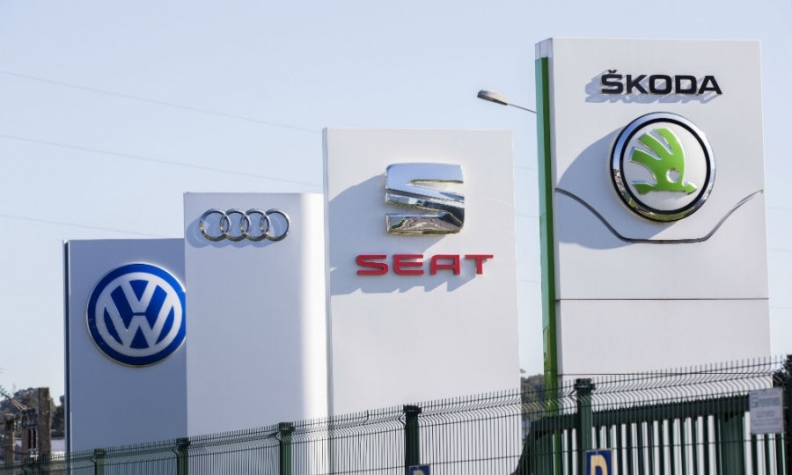 Net liquidity in the group's automotive division fell to 24 billion euros at the end of June, down 3.4 billion on the 2016 year-end figure as "substantial payments made in connection with the diesel issue" put a strain on the automaker's balance sheet, VW said. However the successful placement of a hybrid bond strengthened capital resources. VW did not break out second-quarter earnings for its individual brands in the statement but it gave first-half results. Porsche, VW, Skoda, Seat and Bentley brands helped lift the group's operating profit to 8.9 billion euros in first six months from 7.5 billion in the previous year. The group's operating return on sales rose to 7.7 percent from 7.0 percent. First-half operating profit at VW brand doubled to 1.8 billion euros, thanks to cost cuts, r&d and production improvements and new products. The brand's quarterly operating profit margin increased to 4.4 percent from 2.9 percent a year ago, beating a 2020 target for a margin of at least 4 percent. Audi's operating profit was 2.7 billion euros, the same as in the first half of 2016 as a decline in vehicle sales and investment in new models and technology hit earnings. Porsche's operating profit rose to 2.1 billion euros from 1.8 billion, helped by a "considerable" increase in demand for the Macan and Panamera models, VW said. Skoda's operating profit increased 26 percent to 860 million euros, boosted by the new Kodiaq SUV. Operating profit at Seat climbed 41 percent to 130 million euros, helped by the new Ateca SUV. Bentley swung to a 13 million profit from a 22 million loss due to exchange rate effects and lower model development expenses. VW Group stuck to its guidance for 2017, which sees the return on sales coming to between 6 percent and 7 percent, after reaching 6.7 percent in 2016, and group revenue exceeding last year's record 217 billion euros by more than 4 percent.